On Monday nights when our girls were growing up, Cathy and I would take them to the Golden Spoon for frozen yogurt after dinner. The weekly yogurt run was part of our family identity — part of what made us who we were. Even the neighbors knew our routine and sometimes shouted to-go orders as we pulled out of our driveway. Our three daughters are now grown, but when our family gets together, we still make trips to the Golden Spoon. It’s one of those simple traditions that have kept our family bonds strong. Not surprisingly, a strong family identity also helps children develop a strong and healthy self-identity. Knowing what makes their family unique — traditions, values, and ways of relating to one another — gives children a clear starting point for discovering their own place in the world. Studies have shown that kids who identify with their family’s values tend to be less promiscuous and face less risk of drug and alcohol abuse. I’m a big fan of parents who make the effort to build a strong family identity. But how is it done? Here are three principles that I believe are critical to the process. 1. Be present. Children regard your presence in their lives as a sign of care and connectedness. Families who eat meals together, play together, and build traditions together thrive. Your presence matters! Does your family eat together at least four times a week? If so, there is a greater chance your kids will perform better in school and be less likely to exhibit negative behavior. 2. Celebrate everything! Don’t miss a single chance to celebrate your family. You can celebrate birthdays, graduations, and other rites of passage, but don’t miss out on celebrating life’s smaller occasions such as Little League victories, learned skills, and school achievements. 3. Talk about faith. For some families, spiritual discussions are easier said than done. But having faith conversations with your kids helps to build your family identity. They also help your kids build strong convictions, as they get older. When you regularly expose your kids to God’s truth, it can, as a friend of mine says, “help them develop a sweet tooth for Jesus.” And that’s something far better than buying your kids frozen yogurt at the Golden Spoon. The weeks leading up to Christmas can be filled with joy, anticipation, and excitement. But they also can be filled with exams, homework projects, and family stress. Those things certainly don’t bring out the best in us. 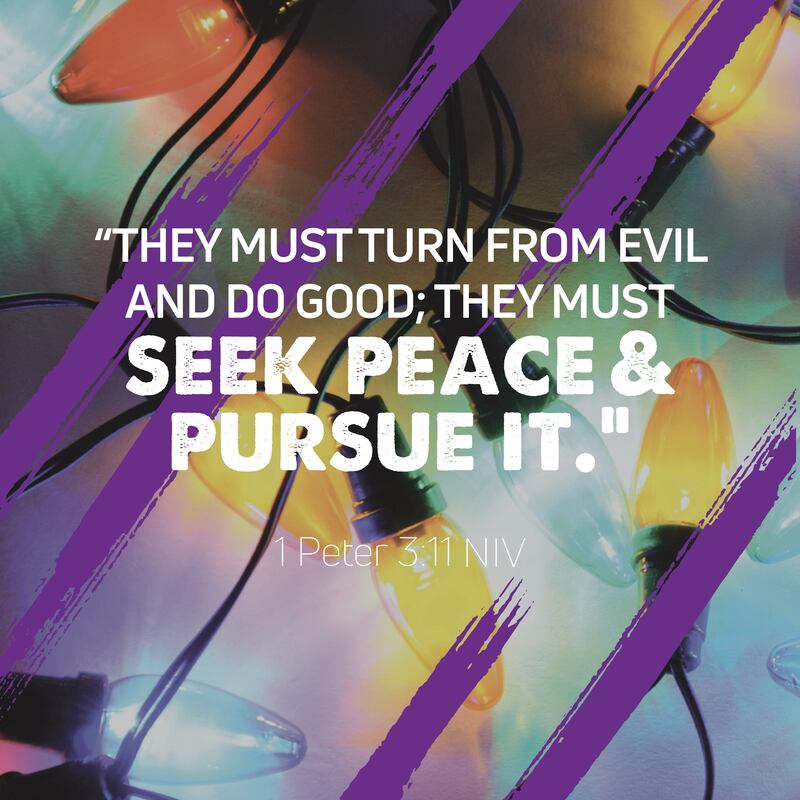 No matter what conflicts or hurts come your way this season, Peter reminds us that we have what we need to overcome it: love. 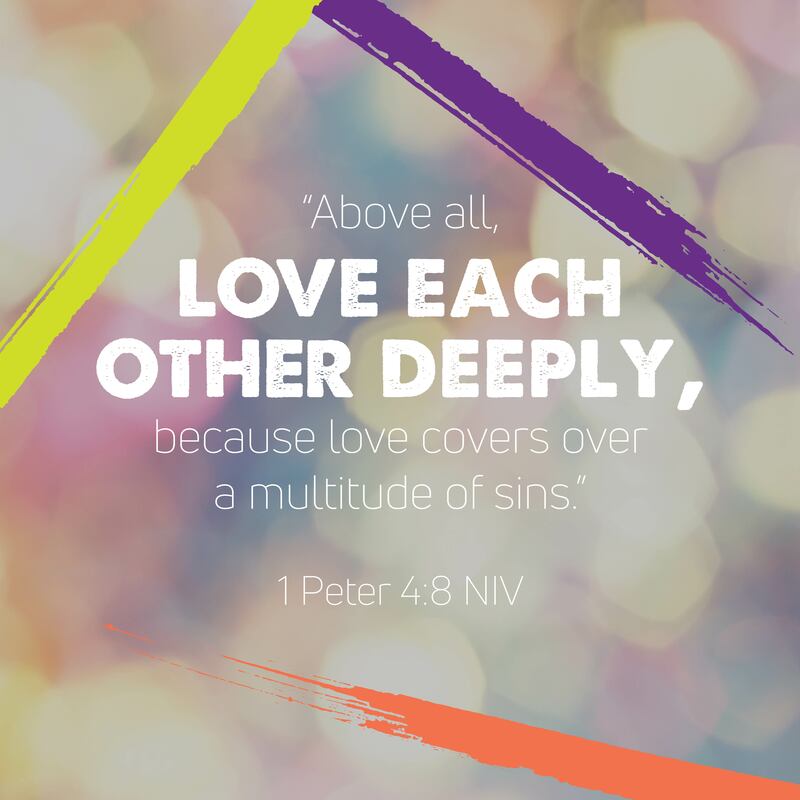 Jesus’ deep love for us covered all of our sins, and it’s now up to us to choose to love others in a way that displays this incredible truth. When you feel stressed out or overwhelmed, pray that God would remind you of His love this season. Of all the ways we can choose to show someone love, laying down your life for them is by far the greatest. But what does this look like on a regular basis? Well, have you ever stuck up for someone who was being bullied? Have you ever shared something with a friend that you could’ve enjoyed for yourself? 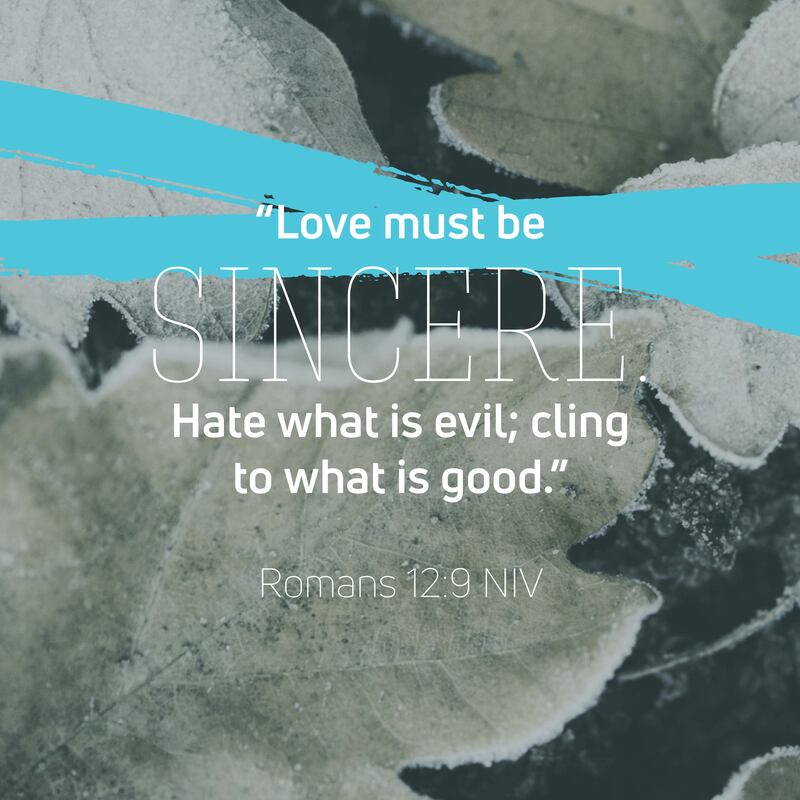 While this isn’t exactly giving up your life for a friend, it is following Jesus’ example of showing love through laying down your comfort and rights. 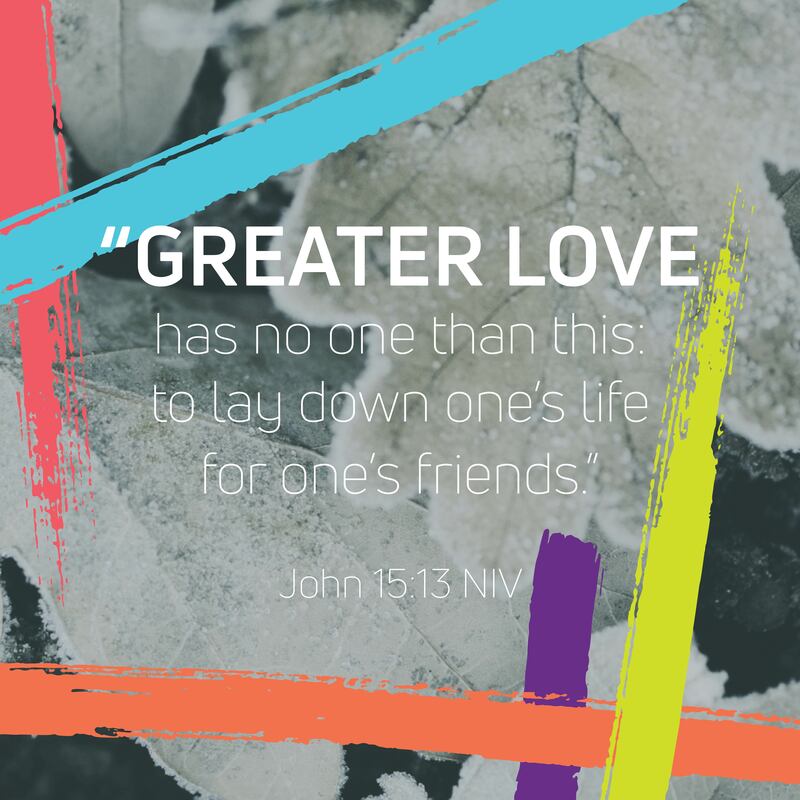 What are some ways you can lay down your life for someone else this week? Ask God to help you take your eyes off of your own comforts and rights and instead place them on those of others. The Christmas season is all about celebrating what is good. God sent His good and perfect son in the ultimate display of love for us. And in doing so, He showed us that while love can be a feeling, it’s also an action. Instead of just telling us He hates evil, God sent His son to defeat it. Instead of just saying we are to cling to good, God sent His son for us to cling to. God shows us the very idea of love is a call to action: to love others out of the love He has shown us. Take some time to thank God for loving us both in words and in action. Have you ever built a sandcastle only to have waves destroy it seconds later? Or worked on an essay only to have your computer freeze without saving it? When you work hard for something that doesn’t last, it can be frustrating and defeating. 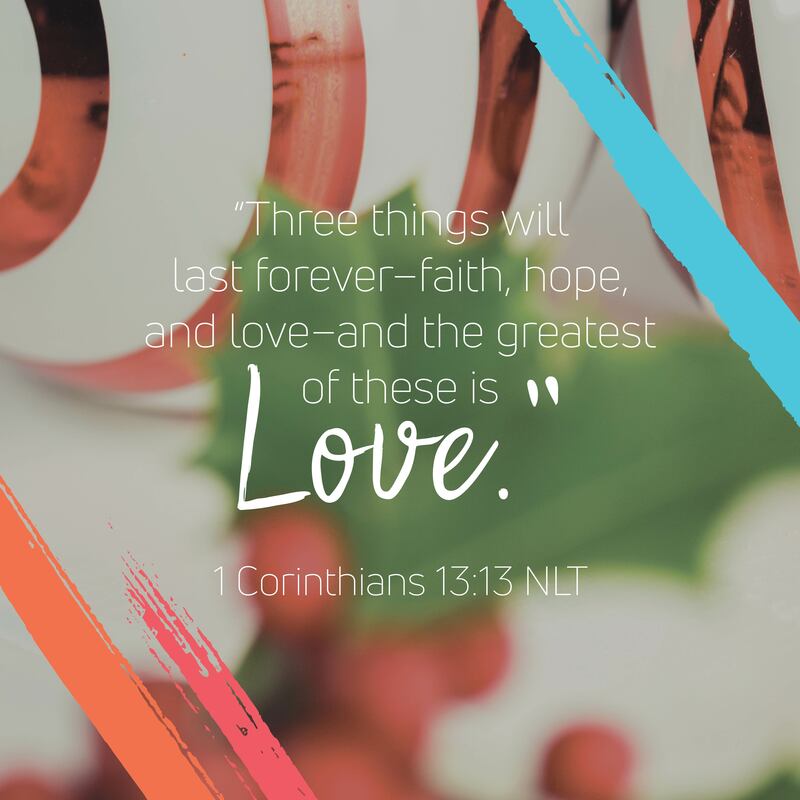 Here, Paul reminds us that while there are things we work for that aren’t promised to last, faith, hope and love are eternal. When we put our energy towards building these things, our efforts won’t be wasted. This week, place this verse somewhere you will see it as a reminder to focus your energy on things that are eternal. We have all likely either witnessed or experienced flattery—the kind of praise that’s not given with honest intentions. This kind of talk is the very opposite of love. It’s not real or honestly motivated. 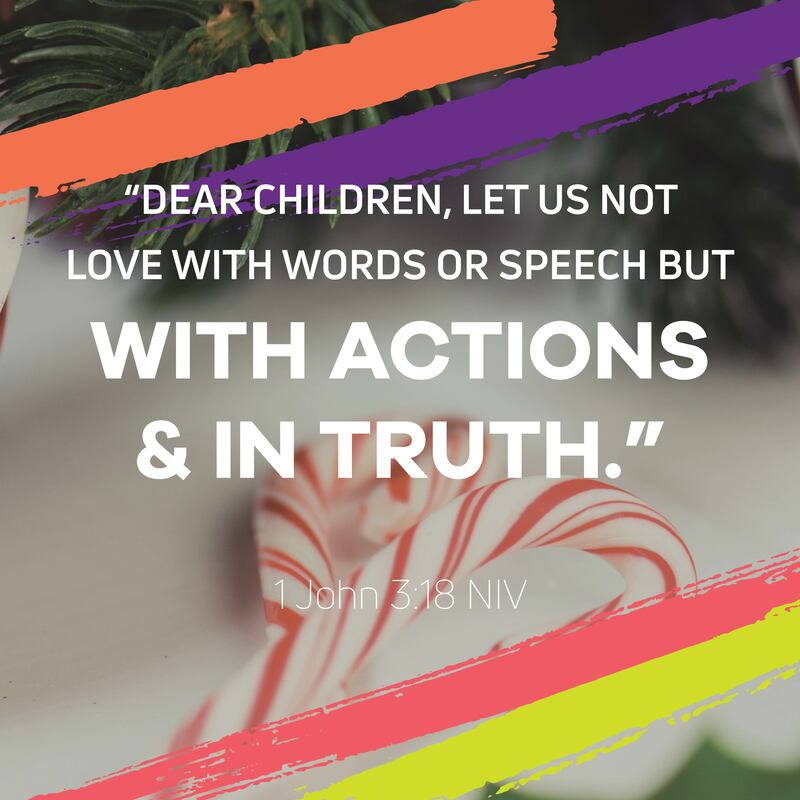 When you are tempted to use quick words in an attempt to lift up yourself instead of honest actions intended to lift up someone else, what can you do to pause and evaluate your motives? Ask God to help show you how to replace self-centered talk with others-centered action this week. Have you ever had to stand guard? It may have been when you babysat a neighbor or even when someone asked you to hold their phone. Standing guard is serious business. It means you promise to protect that treasured person or possession. Paul writes that in the same way, God promises to guard our hearts and minds in Jesus. We are His treasured possessions, and He wants to protect us with all He has. 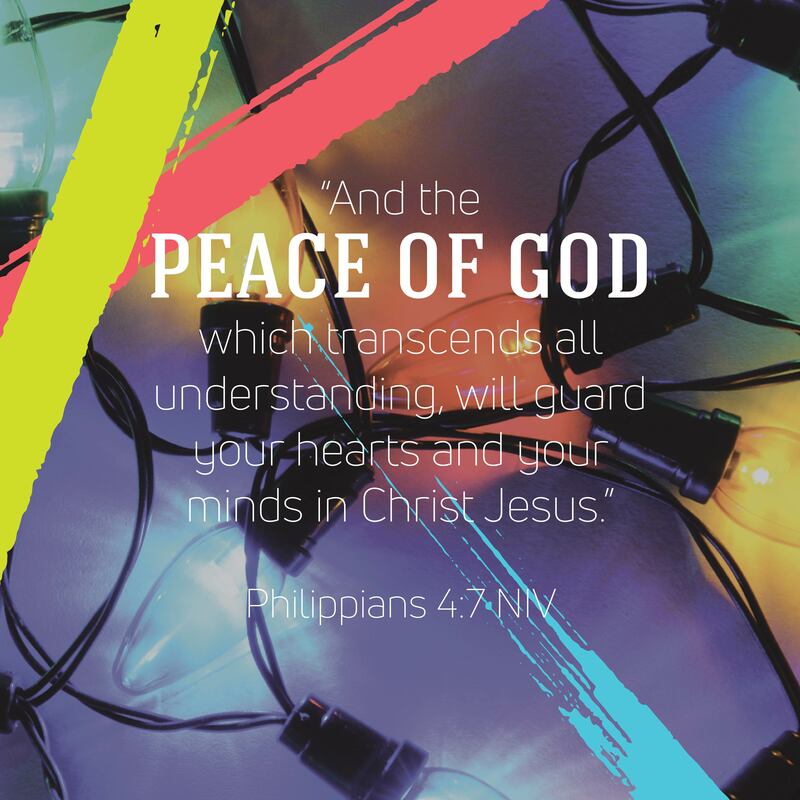 This week, try to memorize this verse so that you can remember God’s promises of protection and peace. God could’ve done all kinds of things to help turn our hearts from evil and back towards good. He could’ve taken any path to seek peace and pursue a relationship with us. But God chose to turn our hearts to good and bring us peace by entering in to a relationship with us. Through Jesus, God made a way for us to be as close to Him as possible. When you think about seeking peace with others this Christmas season, do any relationships come to mind? This week, choose peace and reach out to anyone who comes to mind. Remind them that you care for them and are praying for peace in your relationship. Relationships, especially the peaceful ones, take work. 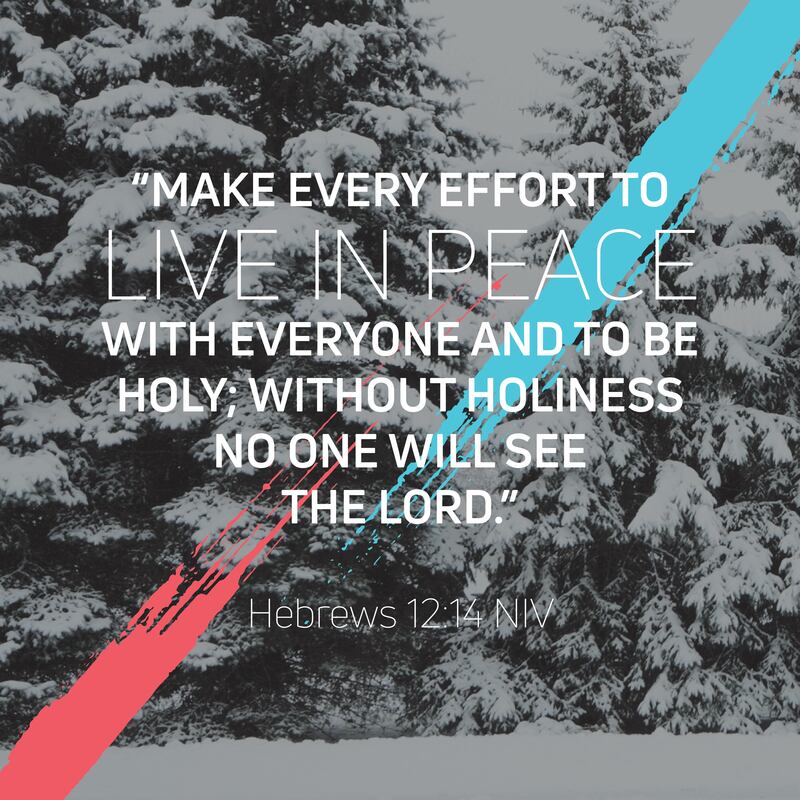 This is why the writer of Hebrews tells us to make every effort to live in peace with others. Don’t worry if it doesn’t seem to work the way you’d hoped it would right away. God promises that the effort you take to live in peace will not be wasted. 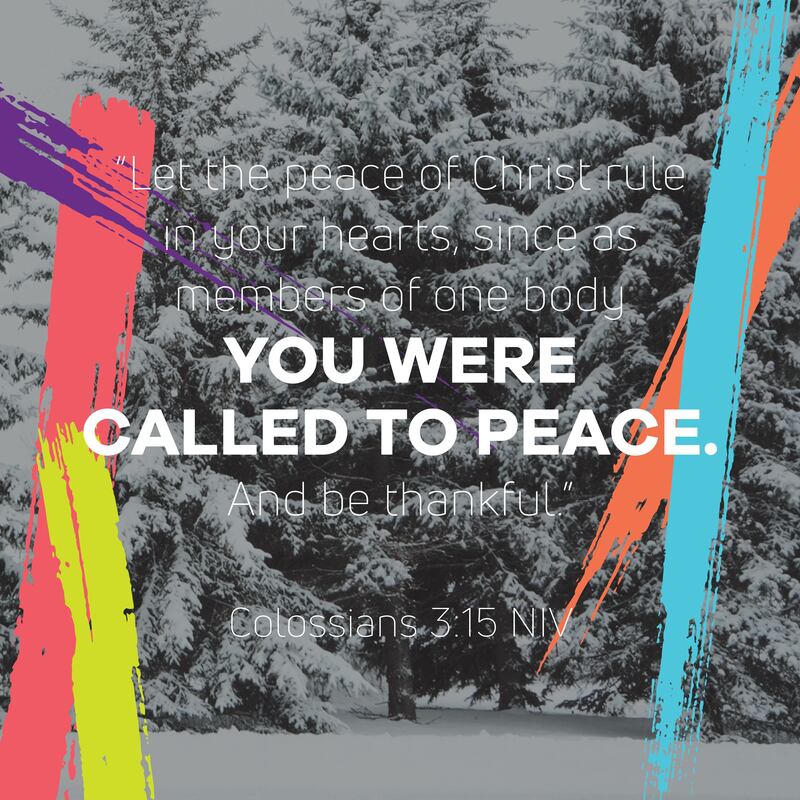 Today, think through how you will respond to others in order to live in peace. Ask God to help you take a step towards peace in even your most difficult relationships.